NOTE: I have moved the search engine to its own page - it can be accessed off of the bottom bar of any page now; and it will not be accessible on others till all page transformation is made. It is just that I am trying to restore my house at 419 S. Main ; its a challenge the house dates back past the 1900 census when I found the one owner listed on the census; making it older than 114 years old. It belonged to Laura Barnshiel (who provided land for an addition to the town of Culver - not sure how that goes as yet but assumed she owned it when the addition was dedicated) she solid it to David Hawk whose family owned all the land on the west side of now Main st. to new St Rd 17 and down to 19th Rd. (the lower end of Hawk Lake) who sold it to Ezra Hawkins (a business man, mail carrier) who's estate sold it to David B. Burns. And yes I am still working on the site - its slow its small stuff on the pages already here adding tidbits here and there but its still active and being updated and added to. It does not seem like it was its been 27 years ago I started this project - there has been no monetary help - a few donations of material and its been a learning experience trail by error so to speak. 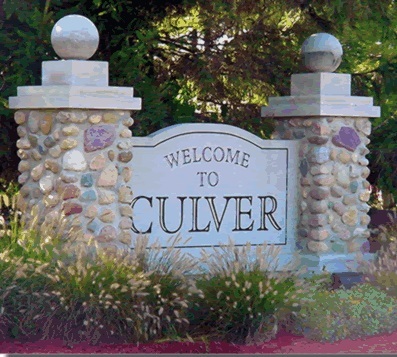 All pages are done personally by me and are all hand coded so there has been alot of work put into the site - it is a project of love for the Lake and the town of Culver in which I grew up around and in. 1953 was the first year that the lake directories were issued and gave a listing of all lake residents (or houses). This was my "FIRST" working outline of the site along with listings from Lake Directories that were in the Marshall County Historical Society; there were but a few scattered issues from 1953-September 1990 when I started on this project. From these I have worked backwards and forwards with what I could find; to trying and make a completelisting of the cottages and lake parcels and create a history for each. The label as "non lakefront" is not meant to offend anyone - nor is it meant to be taken that it does not have lake access it could very well have, I have not deleved into that aspect unless it has been noted in a descrption of the property as having a legal access to the lake - the only meaning intended is that the house/cottage and or property is NOT located on the shores of Lake Maxinkuckee aka "lake side" of the road - or thus directly connected to the Lake Maxinkuckee it means only that there is a road and/or alley between it and the lake. Nothing within is set in "STONE" and everything is subject to change when documentation is found - through deeds, newspaper articles. etc. This is an ever changing prooject and site as new material surfaces. It is a never ending project that I will never see completed in my lifetime. ATTENTION COTTAGERS - you can write up your own history for these pages of cottages, biographies, send in clipped obits and articles etc. etc. - it would be most welcomed! Along with pictures, obituaries and anything else you want to contribute - PROMISE it will be up IMMEDIATELY upon arrival - not several weeks later, if at all possible - large amounts may take a day or two to get up but it will be up as soon as possible. There are new things added a little at a time - they are hidden - I am hoping the "page updated code" is working for this site; on some other sites the same code refuses to work as it should. Much research is needed to connect all the dots or the pieces of the lake cottages and properties that are listed in the various plat maps a good source or starting part would be the remaining abstracts of cottage and/or property abstracts if they still exist. Maybe I have lost my original concept - maybe I have lost my mind - maybe I have bitten off more than I can chew and produce - maybe I am crazy - Any of you are welcome to tell me so! I just hope that someone gets some use out of it, enjoys it, finds it interesting, informative and just maybe learn something they did not know about Lake Maxinkuckee and Culver - I have!. I love history and genealogy - so guess I am entitled to the crazy idea of recapturing - it all - If it can be. I guess I am trying to accomplish to much - I am to much a perfectionist - but David taught me that if you do it do it right - and the same way Genealogy has taught me to do it too - to collect it - to organize it and to DOCUMENT IT with all possible sources etc. I know it is far from complete - there is a beginning, middle and of course there will be NEVER be an ending - Like a family genealogy this will never end till the last cottage and cottager is non-existent. So someone will have to pick-up after I can no longer do this site but who???? I know my efforts may not be appreciated or accepted by certain people but so be it - everyone is entitled to present their views of history and preserve it the way they find it. So far to date I have not seen anything on the Lake and its cottages as I have planned within these pages; this is hopefully just a start. My plan was to put the history the genealogy [people] of the lake together all in one concise area - not here - there and every where in this book - that book - this map - this directory etc. Someone has mentioned idea of book form - possibly - but still allot of work to be done - and if converted to book format - would it have to be condensed to make it feasible for publishing? Would there be supporters? Would any one buy it? With publishing it in book form as is here on the web - it would be an outrageous cost and price per copy. Plus I guess I have the wrong attitude - it is our Lake history - it should be presereved - collected in one area and in a somewhat organized way - and accessible to all. Especially since alot of the earlier history is disappearing - cottages being destroyed, replaced by new ultra modern building. For the future generations to come and for those of today. Just how does one really convert a VIRTUAL history into book form and not loose the content and quality and the accessiblity? Also since 2012 there has been alot of revamping, moving folders to single ones instead of nested into others- to make instant access to material thats been hidden - also to aide in research and in preparing the site for the future when it will be passed on to another... it is hoping by simplifing into into mainly single folders it will not be to overwhelming for the person who will inherit it and that they will continue the tradition I have started in preservation of both the history and genealogy of Lake Maxinkuckee. I threw out all my dad's legal stuff when he passed away in 1991 - including every detail of i nformation about the lake cottage he'd accumulated. I love history - genealogy - and what better legacy to leave my children, step children, grandchildren, step-grandchildren, step-great-grandchildren, and step great-great grandchildren - some of the memories, tales, legends and myths - of David Boswell Burns - now hoping that memory serves me correctly - as piecing together. Thus I am remembering what he spoke of - and trying to document it all into whether it is factual or fiction - using my knowledge of history (instilled into me by Sister Vivian history instructor at Ancilla College) and my love of genealogy - thus the mixture of myth, legend, fact and history all mixed into on great big kettle - and stirred up - becomes - History and Genealogy of Lake Maxinkuckee It's Intrigue. David sure left his mark on Culver and Lake Maxinkuckee - and his ever famous words when asked to do a job - "I'll be there Tuesday" I can hear those words today - and Leon Bennett was given back the sign he gave David with the saying on it [that was in his truck window for several years] - Gee, maybe I can use those words - about this site - SORRY - I'LL DO IT TUESDAY?????? Even if at this point in time it is unwanted by all - keyword - IT IS FREE!. I am the one loosing countless hours of sleep trying to prefect the site - presentation - wondering where the next tib-bit of information is coming from - trying to figure out how to locate and find information - and research materials for free. I welcome the the comments, legends, myths, facts of Lake Maxinkuckee - They do help in recountign and finding the real truth and history. Oh how I wish I had written down much of what David told about the lake and its people - but as it is said hind site is a far better and bitter lesson learned! One keeps asking of the mysterious lights over Lake Maxinkuckee and if anything has been said of them; or if any one has said anything of seeing them - I have never seen them - has anyone seen them? When do they appear? What are their direction of travel? Is there a theory on the mysterious lights over Lake Maxinkuckee? If so what is it?